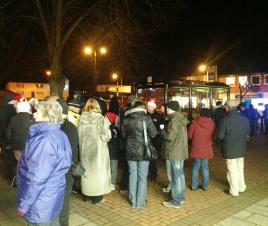 The merry throng was welcomed by the Council chairman, Tony Grice, and invited to partake of mince pies, biscuits, soft drinks and mulled wine, while enjoying some excellent carol singing courtesy of Willow Brook Primary School choir. 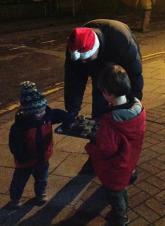 There was also a visit from Santa...no doubt one of several visits to Keyworth during December. 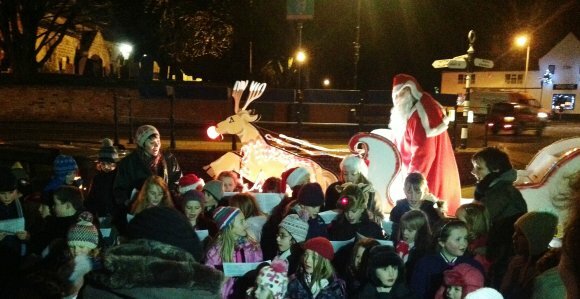 Invited up onto Santa's sleigh, the Council vice chairman, Liz Chmara, thanked the choir for its splendid singing, and everyone else for turning out despite the cold weather. 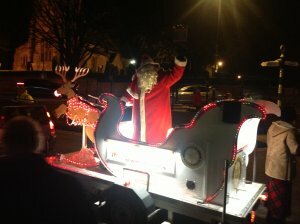 Thanks are due, in particular, to: Cllrs Linda Abbey, Keith Barton, Debbie Boote, Sam Boote, Gweneth Cane, Liz Chmara, Elaine Fletcher, Sheila Kingdom, Kath Oakley and Tony Wells, plus Tim Fahy, for helping with refreshments; Keyworth & Ruddington Rotary for persuading Santa to break into his busy schedule; and, last but not least, our handyman, Alan Wilkins, for being more or less indispensable at this time of year. XHTML 1.0 validated. WCAG compliant. Page generated in 0.1737 seconds.